The on-going Israeli military operation in Gaza is now over a week old. In this week, 172 people have been killed according to Palestinian officials. The UN estimates that 77% of those killed are civilians. 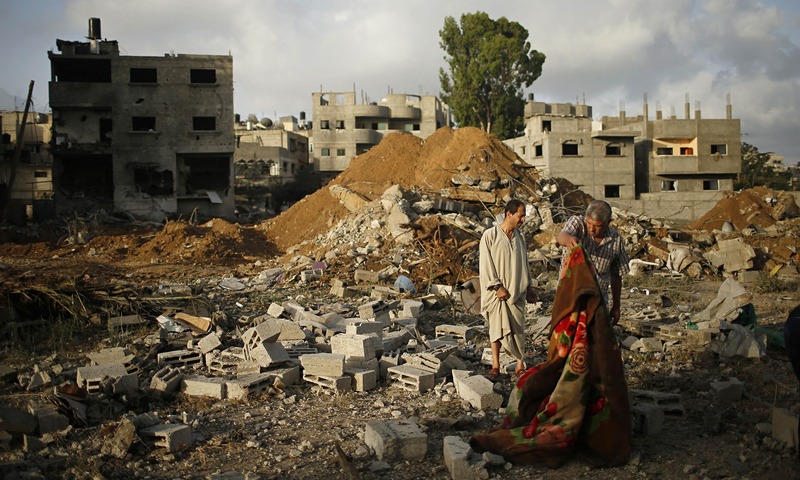 Tens of thousands of Palestinians have sought refuge in UN facilities within the Gaza strip. In the same time period nearly 1,000 rockets have been fired from Gaza according to Israeli sources. It is civilians who are dying in the Gaza strip. It is also civilians who are living in near constant fear of rocket attacks across the south and west of Israel. These attacks that the last week has seen once again constitute a clear violation of International Humanitarian Law (IHL) from both ‘sides’. This principle of distinction not only applies to people but also property. Throughout the last week we have seen multiple examples of the IDF openly saying that it targets the houses of activists involved in armed Palestinian groups. The Israeli human rights group B’Tselem highlighted the case Kaware’a family home which was bombed on the 8th July. The bombing saw the roof collapse killing eight people, six of them children. Another 28 people were injured. This house was owned by Ahmad Kaware’a and his sons. The oldest of which is active in the military wing of Hamas. Even if no harm came of civilians in this attack, it is still unlawful as the house does not constitute a military target. The last week has also seen an increase in the number of rockets fired from within Gaza towards the south and west of Israel. Armed groups within Gaza including Hamas and Palestinian Islamic Jihad have continued to fire rockets either indiscriminately or with the specific aim of targeting civilians. Although no deaths have been reported from over 1000 rockets launched, by definition these rocket attacks are a violation of the principle of the distinction. While some violations of IHL are new, many are much older than the recent media attention. For example, Israel’s policy of blockading Gaza is one that the ICRC has described as collective punishment which is in clear violation of Israel’s obligations under IHL. Because Gaza is considered as occupied territory under IHL, Israel has a legal obligation to ensure the basic needs of Gazans are met. The blockade does the opposite impacting on food security, health provision, education and almost every other aspect of life. In the last couple of days Oxfam has sent out another emergency appeal as the already bleak humanitarian situation deteriorates further. As an occupying power, Israel has a clear responsibility to the citizens of Gaza that it is too often neglecting. Once again violence in this troubled region is leaving civilians on the front line of the conflict. IHL has at its heart the intention to protect civilians at times of conflict. For this to happen, both Israel and armed Palestinian groups need to respect these very basic standards.